More Koreans are turning to mild alcoholic beverages instead of hard liquors, reflecting a growing interest in healthy lifestyles, statistics showed. According to the National Tax Service (NTS), Koreans consumed 3.3 million kiloliters of beer, soju, and other alcoholic beverages in 2007, up 3.8 percent from the previous year. The alcoholic consumption has been rising each year except for 2005, when the consumption fell to 3.1 million kiloliters from 3.2 million kiloliters of the previous year. Beer took 60.3 percent of total consumption, followed by Korea's distilled liquor soju at 29.3 percent. Whiskey took 1.1 percent of total alcoholic consumption. NTS said the statistics show consumers' preference for low-alcohol beverages as a growing number of people are becoming health conscious. Beer consumption grew 5.5 percent and liquor made from fruit, including wine, grew 35.7 percent. Even in the soju market, competition to lower alcoholic content is evident. After launching 25 percent alcoholic content soju in 1962, soju producers have been reducing further, launching ``low-proof soju'' of 19.8 percent and even 19.5 percent in 2006. Koreans, who each consumed 72.43 bottles of soju in 2006, consumed 0.39 bottles less in 2007. The beer market, meanwhile, is expanding. Korean adults consumed 107 bottles of beer in 2007, up 4.5 percent from the previous year. A variety of beer products, including black beer and the ones containing fiber, helped beer manufacturers expand their consumer base. Imported beer took 1.8 percent of the total beer market last year. Most of all, the wine market saw notable growth. 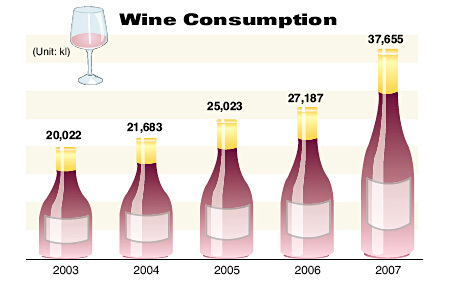 Koreans consumed 38,000 kiloliters of wine in 2007, 2.53 times more than what they consumed in 2000. Koreans consumed an average of 2.03 bottles of wine last year, markedly growing from 1.48 bottles of the previous year. NTS said the concern on health and people regarding drinking wine as a sophisticated cultural activity boosted wine consumption. Imported wine took 85.4 percent of the total wine market last year.